As a part of our investigations to unfold the chemistry of calixresorcinarene, we have focused on the formation of inclusion complex of a poorly soluble (43 μg ml−1 at pH 7) drug mycophenolate mofetil (MMF) an immunosuppressive agent and an inosine monophosphate dehydrogenase (IMPDH) inhibitor with para sulphonatocalixresorcinarene (PSC4R). The complete complexation of the drug was achieved after 48 h of stirring with para sulphonatocalixresorcinarene(PSCR) in water and evaporation of water yield the solid complex. 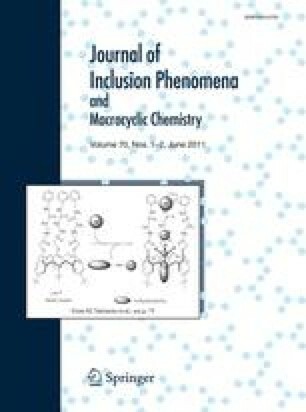 The interaction between para sulphonatocalixresorcinarene(PSCR) and MMF in solid state inclusion complexes was accomplished by aqueous phase solubility studies, Thermal Analysis, HPLC, PXRD, FT-IR, and UV–Vis spectroscopy. The results of the phase solubility experiments are in good conformity to signify the formation of 2:1 PSC4R: MMF complexes. The purpose of this study was to enhance solubility and resulting in high dissolution rate and bioavailability of this essentially water insoluble drug. The results of the in vivo study shows that there is a remarkable change in the toxicity of the pure drug MMF and complex did not produce any mortality up to 2200 mg kg−1. Financial assistance from UGC, New Delhi and CDRI, Lucknow for spectral analysis is gratefully acknowledged.